Beneath the ‘sycophancy/street party’ binary of reaction to Thatcher’s death are questions of alternatives and efficacy. When the MP of Finchley took power in ’79, with Britain in a dire economic situation, was there really “no alternative”? The question presupposes that Thatcher’s slash ‘n burn monetarism at least worked. 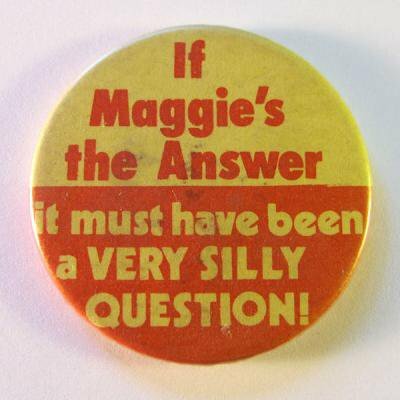 As the badge pictured above states, “If Maggie is the answer it must be a very silly question!” – which it was. Francis Wheen’s Strange Days Indeed portrays the sheer ridiculousness of the late 70s with considerable wit and atmospheric detail. But Thatcher’s ‘success’ often hides just how silly an answer it really was. The story of Blair's New Labour is eerily familiar. Under Major, such withdrawals amounted to only 8% of GDP growth, perhaps reflecting the wider economic climate. But Blair did his homework and let loose – as did Thatcher – a wave of cheap credit, financial deregulation, house price inflation and an equity withdrawal-led consumption boom. Withdrawals under Blair’s leadership totalled around £365bn, that’s a full 103% of GDP growth over the same period. “We have abolished boom and bust” became the Global Financial Crisis. Thatcherism is the ultimate in live now, pay later. Or rather, let others pay later. Conservative thought is inescapably rooted in time, both forward and backward facing, yet Thatcherism – like much neoclassical economics – is largely void of any temporal narrative; all must be consumed. And consumed now. The relationship between ‘those who are living, those who are dead and those who are to be born’ becomes not one of continuity but of expropriation, the efforts of both past and future are sucked into the current moment and devoured in a gross concertina. Her destruction of industry, too, bore the same marks of time compression. Like the textbook models of her intellectual acolytes, displaced workers would effortlessly reskill and slide into more productive and competitive industries: like financial services. Thirty years later, many of those decaying communities are still waiting. Indeed, many of them will be precisely those targeted by Cameron’s welfare purge. Thatcher may be gone but her work continues. My first memory, incidentally, of anything concerning politics was Thatcher, or rather the effect she had on my otherwise very mild-mannered father. In the late 80s, aged around 5, I was baffled that this woman could generate such visceral loathing. Growing up, I absorbed the highly nuanced understanding that Labour – good, Tories – bad, but this made it all the more disorientating to hear at the kitchen table some years later that “Labour are just the same as the Tories now”. Tony Blair, Thatcher’s “greatest achievement” in her view, had arrived. How different today’s youth might find their housing predicament if the proceeds of right-to-buy had been ring-fenced and put towards further social housing. But the moment must consume all, posterity be damned. On the issue of both economic ownership and control, the divisions persisted and escalated, exacerbated by the monetary devastation of the oil shocks in ’73 and ‘79. This line of thought was echoed by Ken Loach when I interviewed him earlier this year about his new film, The Spirit of ’45. An impressive and moving film, I still left the screening wondering whether it would have had greater impact had he really engaged with the Thatcher issue – she didn’t only win, she won three times. She answered something. If Thatcherism was the answer, it could plainly never remain the answer for very long – it is unsustainable even by its own internal logic, such as it is. Making things for a world market is competitive, it’s hard, it needs sound infrastructure, solid education and joined up government. So much easier to simply flog the assets built up by previous generations and bestowed by geography, and load the next generations with debt (Thatcher ran deficits in all but two of her eleven years). What is this if not a “something for nothing” culture? Managing the demands of ownership, participation, reciprocity, equity and productivity still seems as far as off today as it did in ’79. The question of what Thatcher really achieved, and what she left behind, needs to be answered afresh by her supporters post-08. She did not save Britain from economic decline but merely postponed it, and gorged on the assets of both past and future in the process. Thatcherism was a remarkably irresponsible, economically stagnant and anti-social creed; we are still reeling from the consequences.